Author Shaun Assael wades into Liston’s world with a hawk’s eye and the nose of bloodhound. 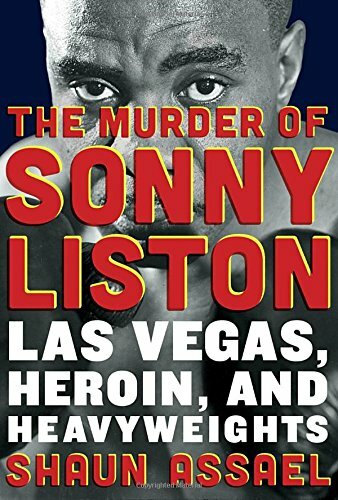 The Murder of Sonny Liston is many things: a biography, a story of sixties Las Vegas, and an investigation into a suspicious death that was never conducted. Despite being nonfiction, The Murder of Sonny Liston tells a good story. It reads like an exemplary bit of hard-boiled crime fiction at times, keeping you glued to the pages. Shaun doesn’t sugarcoat. He’s writing in a heavyweight class and hits hard. You feel thumped by some of this book, grim realities and seedy fantasies coming together in a revelation of Las Vegas that is as ugly as it is glamorous. Vegas has always been a town in various stages of transition, for better or worse. The sixties were in many ways pivotal for its future, a decade that saw much violence, disparity, and change. Going about his business during all of this was Liston, a boxer with the biggest hands in the sport. Often billed before fights as a black-hearted beast rather than a hero, Sonny was neither. He had a poor start in life, little education, and relied on his God given gifts of strength and pugilism. A merciless media often made Liston out to be a simpleton when, in fact, he was far more complex than many would give him credit for. His emotions could be as voracious as his appetites. Both got him into a lot of trouble. While reading The Murder of Sonny Liston one feels sympathy and disapproval for the aging boxer in almost equal amounts. Liston was a husband who tried, but not hard enough. He was a father who loved kids, but had considerable trouble raising his own. He was an incredible athlete as well as a junkie, gambler, and philanderer. After his glory days and the controversies that followed, the former boxing champ was gradually reduced to a drug dealing has-been celebrity for tourists flocking to The Strip. The book serves as a powerful exposé of the hard-knock lives lived in that town during that time period—the racial divide, the trouble with narcotics and crime, the money gambled away leaving dashed dreams and broken folks in its wake. It’s a side of Vegas rarely seen, let alone investigated. In order to set the time and place Assael focuses on much more than Sonny Liston. Muhammad Ali, Howard Hughes, Joe Louis, and Kirk Kerkorian (to name a few) all get ample airtime. Their stories are all fascinating, but sometimes it feels as if they stray too far from the case at hand. Whenever Assael goes out of his way with these characters, you can’t help but get the niggling feeling that there might not be enough to the whole Sonny Liston “murder” to fill a book. The distractions are welcome enough, though it feels lukewarm when you wonder if these digressions have diverted you in order to help increase the final word count. Also, Assael raises a lot of interesting questions about a possible murder scenario, but doesn’t conclusively answer many of them. However, the speculation and circumstantial evidence alone is more than enough to raise a few eyebrows. There were numerable vicious bottom-feeding characters that Liston kept company with who eventually had an interest in seeing him gone. The Las Vegas Police Department played by their own rules with law and order, and they had Liston on their radar for some time, too. Politicians, organized crime, and wealthy tycoons all had their own agendas in Sin City, and in a small way Sonny was often only one or two degrees separated from it. Dirty money was to be made, corruption was widespread, and victims were acceptable collateral damage. Like many others, Sonny soon found himself out of his depth in Las Vegas, a depth that often drowned most men. Very few writers can close the book on a cold case, and this one is no different. It’s the open case that in turn opens our imaginations. The Murder of Sonny Liston is a fitting send-off for a man who regularly received the wrong (or lack of) attention in both life and death. Assael does him justice, painting a portrait of a complicated man whose bad circumstances often led him to make even worse decisions. Despite living a pinball existence in Sin City, Liston was a deserving man. A proper inquest into his death was what he deserved most of all. Going into the book, it would be advantageous to know it really isn’t predominantly about the former boxing champ. The Murder of Sonny Liston in many parts plays second fiddle to Las Vegas, Heroin, and Heavyweights. Assael’s investigation frequently wanders from the path leading to one particular man’s demise, but does so in the best possible ways.